With Halloween just around the corner, many developers are releasing spooktastic apps and Halloween-themed updates. The latest to join the bunch is acclaimed digital toy maker Toca Boca, with their new app Toca Boo. It’s an app about, ahem, scaring the pants out of people. The main character is a mischievous girl named Bonnie, who lives in a big old house with her six family members. The graphical styling is a departure from other Toca Boca apps, with a color palette that’s mostly dark and gray with a touch of hot pink. The gameplay, however, is very much in line with the company’s philosophy: playful and stress-free with plenty of humor mixed in. To get the biggest reaction, Bonnie must be hidden when making the scare. You can hide her behind the furniture, or in any of the blue spots. There are many prospective hiding places in the house, such as under the dining table and even the toilet! One thing to note is that each family member has their own light source. Try not to run into their light path, which will interfere with your sneaking attempts and make Bonnie embarrassed. 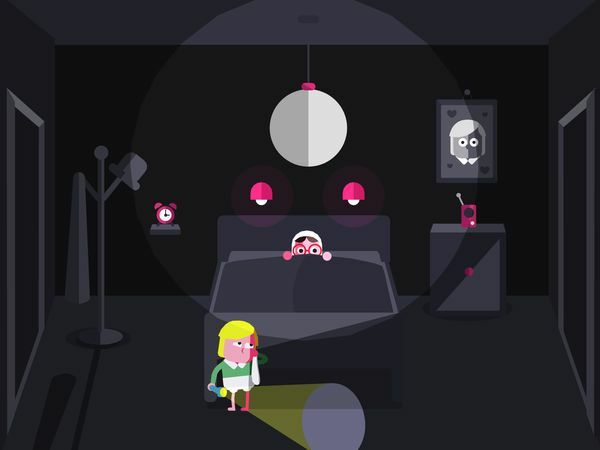 As you wait for the right moment to scare, you can tap on the items in the room to create physical disturbances. For example, you can tap on on the alarm clock to make it ring, or on the rocking to horse to make it move. Additionally, some rooms contain food items: chili, plum, and soda. You can feed these to Bonnie to add spectacular effects to your scare. The more you rattle things, the more anxious the person in the room becomes and the faster their heartbeat becomes. This is the perfect moment to come out of your hiding place and scare them. When family members get scared, they’ll run out the room. You can chase them around the house, or wait for another victim to walk in. You can also explore the house’s two floors and six rooms. As always the case with Toca Boca apps, there are no rules and no time limit in Toca Boo. Instead, kids are in control of the gameplay — will they wait out their victims in a room or chase them around the house? There’s no wrong way to play. Simple and intuitive, the app is suitable for kids ages three and up. Some kids may not feel comfortable with the tension though, so I would suggest accompanying them as they play. You can use the opportunity to ask them to share about the things they fear, and discuss ways to overcome them. Toca Boo doesn’t contain ads and in-app purchases. Toca Boo offers a unique playing experience you don’t see in most kids’ apps. It’s dark, spooky, and thrilling. But it’s also mixed with crazy humor that is just so Toca Boca. For example, feeding Bonnie plums will make her pass purple gas as she makes the scare. Then, there’s also the family members’ over-the-top reaction when they get spooked: Mama’s hair buns get undone, Big Bro’s pants fall down, and so on. Other fun details in the app include the scaredy snake in the closet, the disco ball in the twins’ bedroom, and the headless pet dog (spooky-much?) that will spark discussions for sure. Is Bonnie’s house a regular old house or is it really haunted? I’m pretty sure kids will have much to say in that discussion. Finally, one other nice thing about the app is it encourages kids to be brave. At the beginning, we’re shown that the ghost is actually a little girl wearing a sheet. This shows kids that sometimes things may look scary but actually aren’t. Hopefully, after playing the app they can learn to manage their emotions and be more confident in taking on new challenges. The newest app from Toca Boca offers a thrilling experience one doesn’t see often in kids’ apps. Players control Bonnie, a little girl dressed in a white sheet, as she roams her big old house to give her family members the scare of their lives. It’s a bit spooky, but ultimately exciting as kids discover that the dark is not always so scary after all.